There was a lot of hype over this book, and I went in expecting the worst. ha. Most hyped books haven't lived up to the hype at all, but this one was amazing. Author Tahir brings readers into the Martial world by way of two voices. Each chapter alternates from Laia, a slave, and Elias, a solider, points of view. The world they live in is brutal and unforgiving. When you make a mistake for it, you are rarely the one who pays for it. The punishment falls on the heads of those you love in horrific ways. It's a world ruled and survived by fear. Laia is living with her grandparents and her older brother, barely surviving in poor conditions. But then her brother is arrested for treason and she is forced to seek out a rebel group for help. In exchange for their help rescuing her brother, she must spy for them in the Empire's military academy, which might be the most unforgiving place she's been yet. Laia isn't brave or strong, but she's determined to save her brother, and her love for him is what pushes her. It's at the academy that Laia meets Elias, the toughest, most brutal solider the academy has to offer. But Elias isn't as loyal to the Empire as everyone thinks he is. He isn't as unfeeling towards the violence as his training suggests. Both Elias and Laia are on paths they wouldn't choose for themselves. Neither are free. But somehow their destinies are fated to meet and move towards changing the Empire forever. This book gripped me from the first chapter. It's been awhile since I've read a book that had me tensed in anticipation, anxiety and fear. I kept waiting for this book to fall into some pattern I recognized, some cliche to let me predict the outcome. But it never did. I was never certain what would happen and I was turning pages with my breath held, quite literally. When I put this book down, I turned on the TV and watched mindless shows for an hour to get my body to relax. haha. 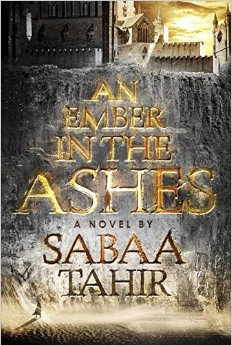 Tahir created a brutal world, and she stuck by it. It's an explosive debut novel and I cannot wait for the next one. This story felt so human. Love and moral rights were the deep center of this story and I found myself emotional several times over small details and giant happenings alike. I also liked that while there was a tiny bit of romance here and there in the book, this story was not ruled or driven by it. That was a refreshing change. Definitely a must read. I chose chamomile tea for this book because it's got you on edge for many of it's pages. Something soothing to balance the action or to drink afterwards to loosen up.